Brushless electric motors are quickly becoming the hottest thing in speed RC boats. Their superior efficiency and lack or brushes makes them an attractive option to brushed permanent magnet motors. 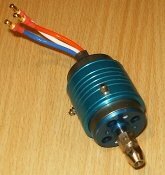 Brushless electric motors are an excellent option if you are looking for a powerful and efficient motor for your speed RC model boats. A typical Brushless Electric Motor with water cooling jacket. There are a few drawbacks of brushless motors. The most important is their relatively high price compared with traditional DC motors. The cost is sure to come down over the next few years. Remember to shop around, read reviews and ask people. You'll find the best prices on ebay or Amazon, but are they any good? I don't know. However, I think all brushless motors for hobby use are made in China these days, I don't think there necessarily is much difference between a brand name and the low-cost competition. 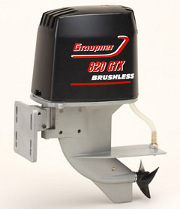 Another option is the brushless outboard motors from Graupner. The benefit with an outboard motor is that there is a lot less drilling in the hull than modifying a hull for a standard propeller shaft. For just about all electric scale model boats, brushed motors still makes sense. If you have a PT boat, motor torpedo boat or planing launch, and you’re itching to try a brushless – then by all means, go for it. As far as brushless and scale models, a new venue is opening up, much as it did for planes and helicopters. It is now possible to build much smaller RC boats than what used to be possible largely thanks to new technology in high-efficiency brushless motors, condensed battery sizes through LiPo-technology and new compact RC gear. Converting plastic kits to RC has also become wide-spread for the same reason. You may have to play with different size and pitch props to optimize performance going from a brushed to a brushless. Most brushless electric motors on the market are designed for airplanes, helicopters, cars and trucks. These motors are all air cooled. For model boats, watch for motors with an integrated cooling jacket. Some manufacturers make you buy it separate. When you shop around, make sure you consider this extra cost.